Let me tell you a little more about the Four Beasts Mountains before I go further. The mountains are located to the east of Taipei City in Taiwan. 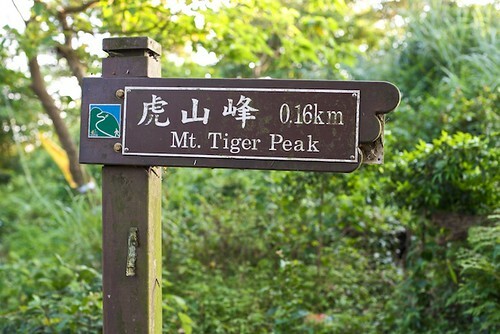 They’re named after four animals that they supposedly resemble: Tiger Mountain (虎山), Elephant Mountain (象山), Leopard Mountain (豹山) and Lion Mountain (獅山). The highest point you can go in the range is called 9-5 Peak (Jiuwufeng – 九五峯). They also have a fantastic trail system that’s the subject of this three part series. If you’re paying attention, you might have noticed that I’m writing a three part series on this area. “Huh? Why a three part series on four mountains?” you might be thinking. That’s because Leopard and Lion Mountains don’t really have any trails or reasons to visit them. My three subjects are 9-5 Peak, Tiger Mountain and Elephant Mountain. Have a look at this map and you’ll understand. 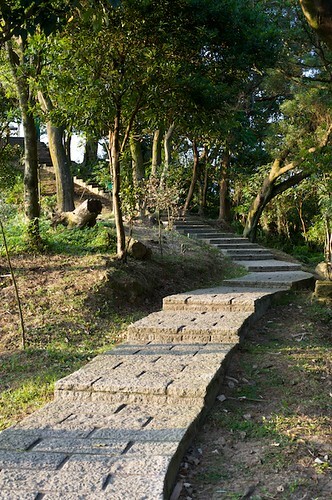 Tiger Mountain is physically the easiest to walk of the three main mountains, but you’ll need transportation to get there. You can drive right up to the trail head and then it’s an level walk along a ridge line to the first view point. The only real difficulty is finding the road that leads to it… no worries! Here’s a Google map. You could also follow the directions at the bottom of this page and walk up in about 3o minutes. 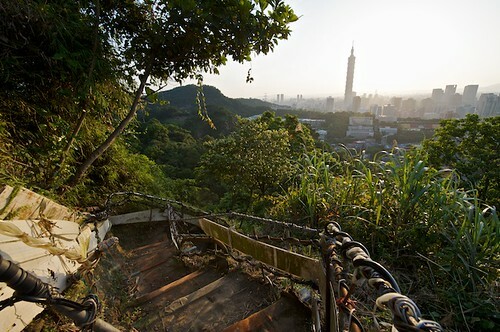 Like the 9-5 Peak trail and Elephant Mountain, Tiger Mountain has stunning views of Taipei 101 and Taipei City. The first platform is a 5 minute walk from the trail head. The second is about 10 minutes further and requires the navigation of a sturdy, but home-made and scary-looking staircase. The one staircase on Tiger Mountain can be a little tricky. Unlike the others, Tiger Mountain is not lit at night. 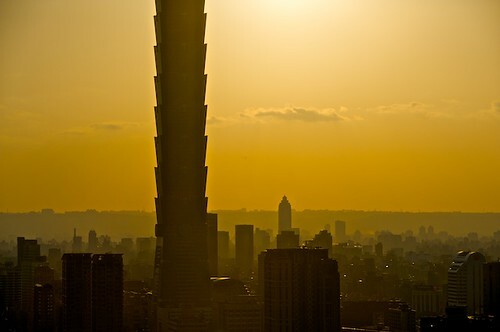 Be sure to take a flashlight if you plan to take some sunset or night time photos of Taipei 101. 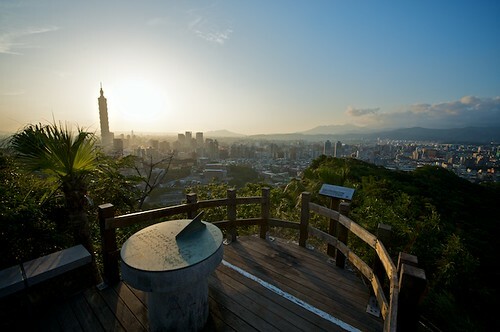 The view of Taipei 101 and Taipei City from Tiger Mountain. Also check out The Daily Bubble Tea’s post on the same area. Here is a big photo of a map of the trails. This is part two of a three part series on hiking the Four Beasts Mountain trails. Part one is on 9-5 Peak and part three in on Elephant Mountain. You can take bus Blue 10, 257, 263, or 286 to the Fude Elementary School , then take Lane 251 of Fude Street; or take the MRT Bannan (Blue) Line to Houshanpi Station and then take bus 207 or 263 to Fengtian (Fongtian) Temple. Then follow Lane 221 or 251 of Fude Street. Nice pics Neil. Thanks for once again reminding me how long it’s been since I’ve gone hiking in Taipei. Absolutely stunning. 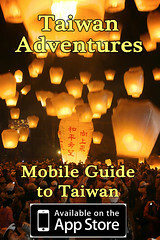 I’m bookmarking these so I remember to try these hikes next time I’m in Taiwan! Thanks Andy! Like I said, these mountains are some of my favorites in Taiwan and they’re sooo accessible! Check back in a few days and I’ll have the last of the series up: It’s on Elephant Mountain, the most popular and the closet to Taipei 101. Oh My God, Those pictures are awsome!! I loved going up there when I was in Taipei. I’m surprised not many more locals new about that place. When I asked they said they didn’t know. I really think it’s the best view of Taipei and it’s free! It’s just the hike can be tough for some but so worth it. Hi, I would like to check if there is any difficulty going to Tiger Mountain during the New Year Eve? Will there be any traffic jam? I am afraid there will have a lot of people going to the 3 mountains for photography and having difficulty going up and coming down. Do you went to any of the 3 mountains during new year eve? I am from Singapore and will be travelling there so I want to get more information before going there because I do not want to miss the new year eve count down. 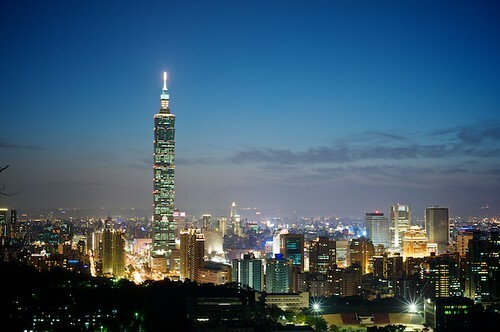 And I want to photograph Taipei 101 fireworks. Yes, it’s VERY crowded on New Years Eve. People start setting up as early as 12 hours before midnight. I’ve never actually gone up there then, because of the crowds. I honestly don’t know what to tell you, other than to set up early. 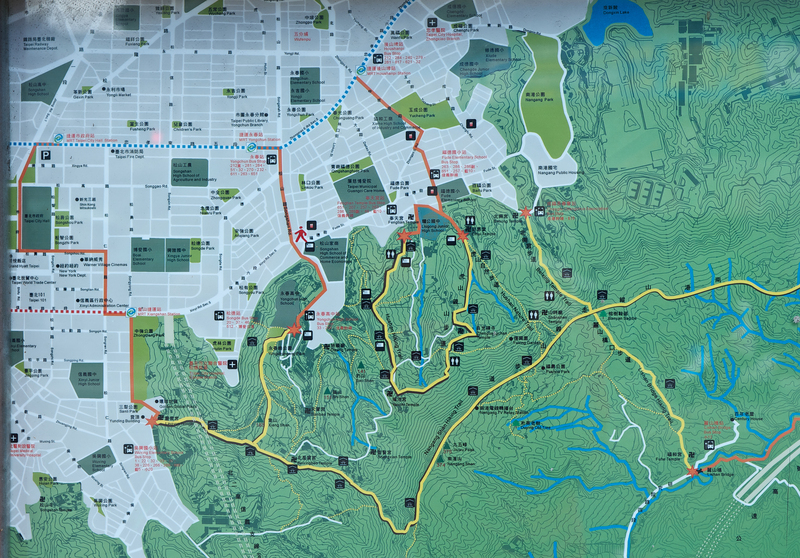 What if I don’t have a vehicle, is it a long walk to get to the trail head of Tiger Mountain? Have you tried it? Mind sharing it with us as well? Will be going there very soon. TIA. Hi Jay, The way I wrote that is actually a little deceptive (I’ll change it soon). It’s not that hard to walk to the trail head. Click on the map at the bottom of the post and it will tell you how to get to several trailheads, including the one for Tiger Mountain. What I meant by “needing your own transportation” is that there is a way to visit Tiger Mountain by driving and parking up on the mountain. If this is done, you wouldn’t have to walk up any steps. That said, it’s a lot more rewarding to walk the stairs and see more of the mountain, and it’s not too hard to do by public transportation. Hi Neil, is the trail lit up at night? If I’m not driving up, I was wondering how difficult it is to get down from the top of the tiger trail after dark? or is it pitch black and dangerous? Most of the main trails are lit. I’m actually not 100% sure that the Tiger Mountain Trail is lit all the way to the street, but I can’t imagine it wouldn’t be (So I’m 99% sure it’s lit, ha) But even if you’re walking on the main trails, I recommend taking a small flashlight because sometimes the space in between lights gets dark. That’s great Neil! Many thanks for the tips! This page is great! There were so many places in Taiwan that I was able to visit. Next time I hope I can squeeze sometime to visit and experience the beauty firsthand! Thanks for your useful information. May I ask where did you take your cover picture ? Sadly, that “home-made and scary-looking staircase” has been replaced with steep but boring concrete steps. Yeah, I’ve seen that! Damn shame, I feel like the mountain has lost a little bit of character.